Marco Rubio took one small sip of water - and started a deluge of tweets, memes and of course, the now-famous GIF, thanks to Buzzfeed, of his untimely water break during the GOP rebuttal to the State of the Union address. "I needed water, what am I going to do?" 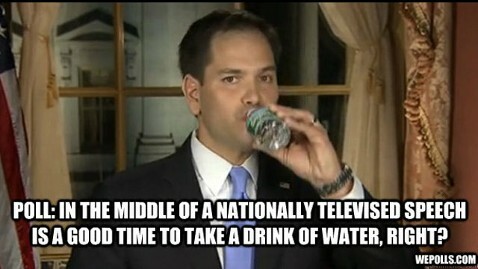 Rubio said on "Good Morning America" while playing along with the joke - pulling out a bottle of water and taking a sip. "God has a funny way of reminding us we're human." 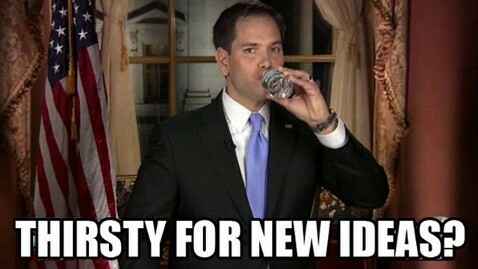 Even Marco Rubio is playing Marco Rubio drinking games. Rubio joined in on the fun, tweeting a picture of what has become the most famous water bottle in America. While Oreo cookies found the perfect moment to join the social conversation during the Super Bowl blackout, Poland Spring's social media accounts stayed dry during the Rubio #watergate. Jane Lazgin, a spokeswoman for Poland Spring, which is owned by Nestle, told ABC News today the company was glad its product was the one chosen to alleviate Rubio's cotton mouth. "Everyone gets thirsty and, you know, we're really glad that Poland Spring was right at hand for Senator Rubio during his need for refreshment," Lazgin said. "We love water, all kinds of water. People drink a billion packaged beverages a day, so when they are looking for water, wherever they are, the simple refreshment does what it did for Senator Rubio last night. It's handy, it's there - the brand they know, Poland Spring."